Tresorit protects the files you never want leaked or lost. No Tresorit admin, hacker or government can access your data. Hacking even just one file takes lifetimes. We offered $50,000 if someone hacks our system. 1000 hackers from 49 countries tried, but no one succeeded. Tresorit handles data under Swiss privacy laws that provide stronger protection than similar laws in the US or even the EU. Every file added to Tresorit is automatically encrypted and uploaded to the cloud. Any changes are instantly backed up. Tresorit’s servers are located in the EU, protected with top-notch physical security and disaster prevention systems. 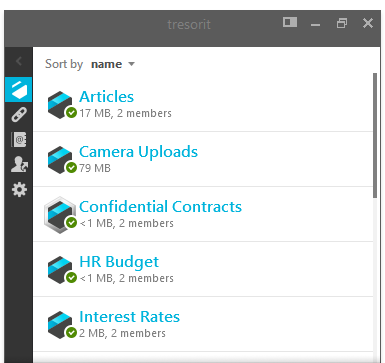 Tresorit for Business comes with more than enough storage for every coworker to store sensitive work files and documents. Access your files even on the go – from Windows, Mac, Linux, iOS, Android, Windows Phone or Blackberry. With 2-Step Verification and device lockout, your data is secure if your password or device is stolen. 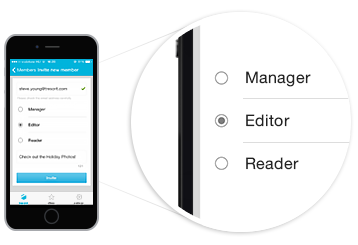 If you lose your device or someone swipes it, remove any Tresorit protected files with a click. No need to move files around. Drag and drop any existing folder to sync it safely to the cloud. Work with others on sensitive documents like presentations or reports without the pain and risk of email attachments. See what your collaborators are up to. 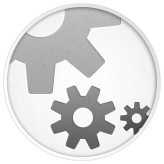 Access and roll back to any document’s previous versions. Sharing files and folders is easy, and doesn’t mean you have to give up control. Modify or revoke access anytime. Share files, folders & tresors via Link. Access only requires a browser and can be revoked with a click. Decide if your shared documents can be copied, emailed, printed, shared or screenshotted. See crucial stat logs like who logged in, where and what device they used at a glance. Make 2-Step Verification mandatory to ensure security standards are high throughout the company. Restrict access to the office or other company premises. Limit access from mobile devices if needed.